We have just added more artworks to our website such Masks, Plaques, Ivory and Sculptures on our website. Please check them out at our online Store under New Arrival Section for more detail and selection. 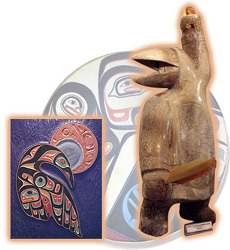 Northwest Tribal Art (Northwest American Native Arts) is one of the leading gallery showcasing museum-quality Northwest American Native and Inuit artwork for collectors since 1981. For decades, Northwest Tribal Art has earned a reputation for bringing fine native artworks from emerging and renowned artists who bring the cultures and legends to life. Highlights include artwork from nations of Makah, Haida, Salish, Tlingit, Kwakwaka'wakw, and Nuu-chah-nulth's fine carved Argillite pole, bentwood boxes, bowls, drums, fossilized Ivory, masks, soapstones, panels, paddles, plaque, rattles, and totem pole along with book, clothing, jewelry, prints and original paintings by renowned artists. Ever wonder when shopping for Native Art what the symbols mean? On our website, we have tried to make it easier for you by including the definitions of the most popular symbols here.